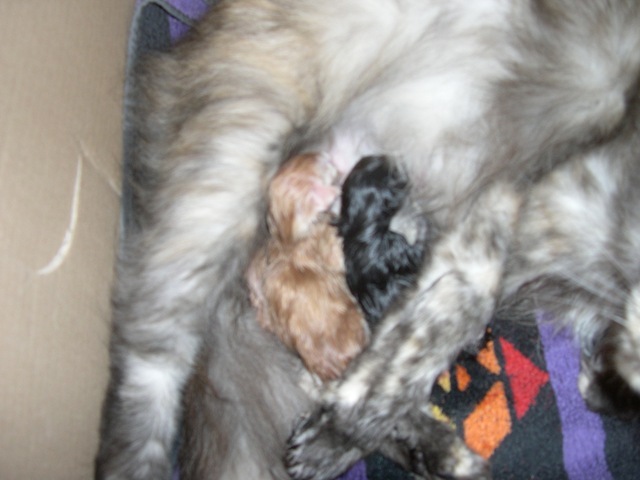 Even as I write this, Ananda is purring and grunting away in her kitten box to her kittens. 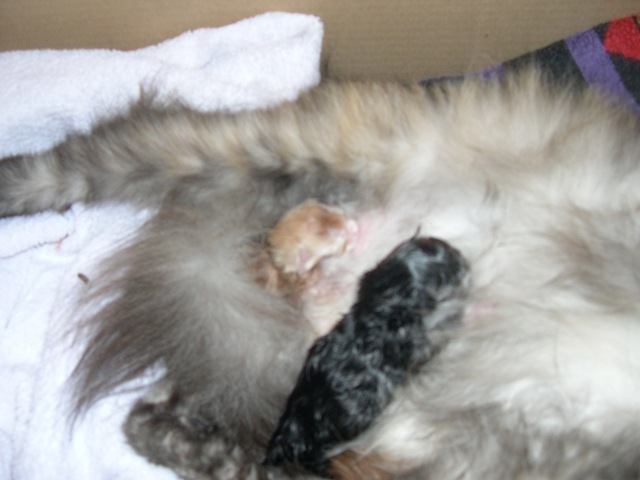 She had 5 kittens, born in the early hours of 17 May 2008. The actual birth process didn’t start until about 2.30am. But the lead-up to it was fraught for both of us. I know I’ve been through it before, but I always worry about what ‘s going to happen. I spent most of the night apologising for getting her in the family way and rubbing her tummy which she found comforting. There are apparently two types of pregnant cat behaviour. There are the independent cats who prefer to seek a hiding place somewhere to have kittens on their own. Then there are those who seek out their owners help. Ananda is definitely the latter and sees me as midwife and cheerleader. She had her first kitten on the bed – it was a messy business and accompanied by heart-wrenching screaming. Not something you really want to go through with a beloved pet and something to bear in mind if you’re thinking of going into cat breeding. Once her first kitten was through and she’d cleaned it up I quickly put it in the kitten box and picked her up and put her in there. She had the next two in quick succession, and then nothing. So after about 2 hours, and after last year’s experience, worried that there were kittens stuck and possibly suffocating, I tried a few homeopathic remedies. Maybe it was coincidence, but literally minutes after administering caullophyllum she had another two. I helped out with all of the births, I cut the cord on 2 of them and helped to dry them because the ones that were born were trying to suckle which made it a bit crowded. But Ananda did most of the work – she’s really got the hang of it now, eating, chewing, cleaning. That was about 5am and my eyes were nearly glued shut with tiredness. I felt her belly and it still felt swollen. So in the end I decided to wait until the vet opened and ask for a home visit. In the meantime I changed her bedding, fed her water from a dropper and gave her some Arnica and Animal Magic drops which contain Royal Jelly, Ginseng and Honey. The vet visited and thought he may have felt something, but it was very high up, and if it was a kitten the only way to make sure was with an X-ray. He thought it was probably impacted faeces. As a precaution he administered oxytocin to push any potential kittens or placenta through – I didn’t quibble this time – and said he would pop in after the surgery closed this afternoon. When he came by later, he palpated her again, and he thought this time it wasn’t a kitten – hooray! No need to tell me me how lucky the vet’s is nearby, and it’s something I’m going to have learn to do, to feel a cat’s belly and know whether or not there are kittens waiting to come out and when to wait or when to worry. I suspect that the mass was probably the 5 placentas Ananda had eaten that morning. She made a relatively quick recovery, considering it was childbirth. She’s a bit anxious and clingy though and whenever I’ve left the room, she’s followed. And what’s happened sometimes is that a kitten who’s been nursing on her teats has held on and then fallen off outside the box. At first I was worried in case it was injured, but praise be, kittens are more robust than you’d think they’d be. In fact, another breeder told me how one of her cats used to rush out of the kitten box with kitten clinging onto a teat, the kitten would fall off, and the impetus of the charge would cause the kitten to slide across the wooden floor! As mentioned there are 5: 2 gingers (probably male), 1 cream, 1 mackerel and 1 mackerel with white paws. Weights are good, well over the 100g mark each. I haven’t sexed them yet because whenever I pick them up they scream blue murder and Ananda gets upset. It probably feels like some eagle has plucked them up into the sky. I could do with a good night’s sleep though. I doubt I’m going to get one for a long time. Nursing kittens are noisy when they fight over teats. But I don’t mind – it’s a special time, watching them grow up.